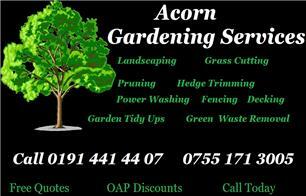 Acorn Gardening Services - Fencing/Gates, Garden Services based in Swalwell, Tyne and Wear. Acorn Gardening Services is a family run business, we have been working on gardening and landscaping for many years and gained essential knowledge and experience. We undertake all aspects of work and complete to a very high standard and always go that extra mile for our customers as they always come first. As a company we pride ourselves on providing an A rated friendly service to our clients, being reliable, efficient and strive for excellence in every aspect of our trade. We are very reasonably priced and affordable. We will price match any company. Free no obligation quotations. Senior citizen discounts available.